Il Susino is a beautifully restored house in a peaceful setting close to the historic city of Lucca. 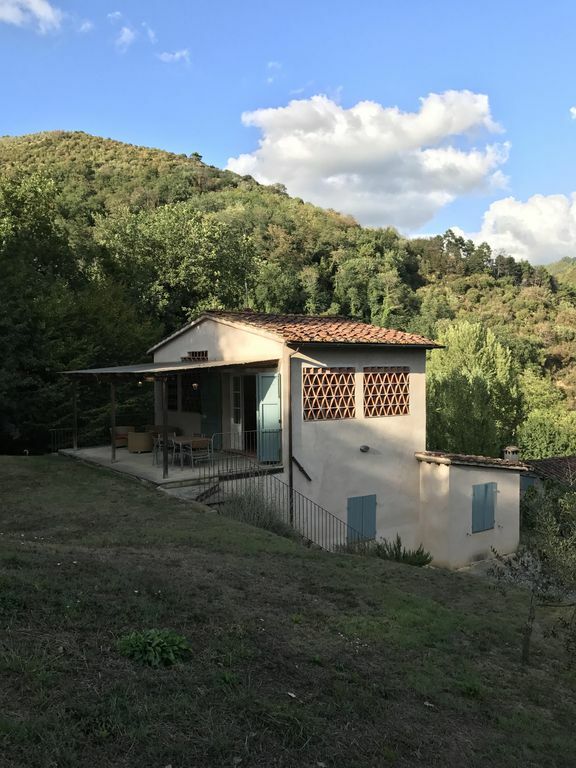 The property offers not only a lovely private rural setting but also the convenience of being five minutes from the nearest village and 15 minutes from Lucca. The house is newly restored to a very high standard with great taste and charm using authentic Tuscan materials. The interiors are elegantly furnished with antiques throughout as well as ultra modern fittings in the kitchen and the bathroom. The rear terrace is very attractive, perfect for al fresco dining and offering views of the surrounding countryside. The area is perfect for walks and hill climbing. History of A Parino: A Parino is surrounded with history. The valley was a key Etruscan settlement. Ancient Etruscan pottery has been found close to the stream, which runs through the property. The house is also located on the Via Clodia, the major Roman road, which linked Rome, Lucca and Luna. The names of the surrounding villages indicate the number of leagues (one and half miles) they were from Lucca. There is a small Roman footbridge close to the house and a beautiful Roman church in San Donato, 1 km away. The strategic location of the house is also apparent as it stands on the Gothic Line, the German main defensive line in 1944-45 against the Allied advance from southern Italy. For over 9 months, the Americans and Germans fought between opposing hillsides. On the hill behind A Parino, there are remains of German bunkers, while in front lies the ruined church, held by the Americans. While enjoying the tranquility and beauty of A Parino and the countryside, your imagination is captured by its history! Festivals: There are two major festivals in the area during the summer. For opera fans or people who would enjoy an evening out in the stars, there is the world famous Puccini Festival at Torre di Lago, 30 minutes away, which takes place throughout July and August. For 2009, the operas are La Boheme, Tosca, Manon Lescaut and Turandot. For rock or pop fans, there is the Lucca Summer festival, where concerts take place in July in the Piazza Napoleone in the centre of Lucca. For 2009, there are concerts by Lenny Kravitz, James Taylor, Anastacia and James Morrison. We are an Irish family living in Asia. We purchased Il Susino in 1999 and renovated it about 7 years ago. The house has outstanding views and is surrounded by woodland in a lush valley. It was an old barn, that has been completely refurbished. The name, Il Susino, comes from the plum trees that surround the house. Lucca is a beautiful walled medieval city, which is the birthplace of Puccini. The city is mostly pedestrianised, which is fantastic for cycling and walking. Most guests enjoy cycling round the ramparts of the city wall. The countryside north of Lucca is breathtaking with many medieval villages perched on wooded hillsides. There are many beautiful palazzos and vineyards to visit in the area. Florence, Pisa and the beaches are all within a short distance. There are excellent restaurants, including a Michelin star, within ten minutes of the house. The Tuscan ski resort of Abetone is only one hour away and has generally excellent snow from January to March. The immediate surroundings of the house are beautiful and most guests enjoy this for relaxation or exercise. There are lovely walks and circuits (between 2 to 6 kms) in the wooded hills around the property. Visit the ruined church on top of the hill. See the snow-capped Apuan Alps.